Sorry for not getting back to you sooner. I have some not so great news... 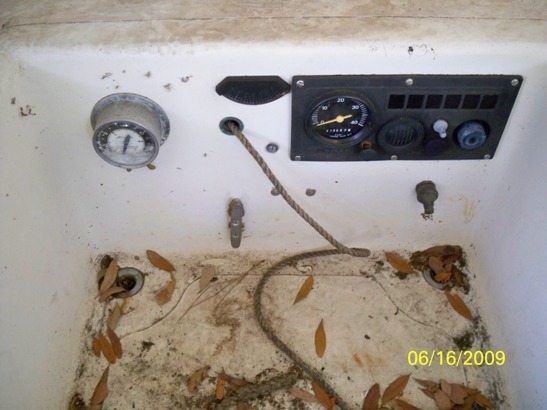 The more I got into the repairs, the more I found that I didn't have the time necessary. So I traded the Dolphin back to the previous owner, Ken Harper. Ken has since sold Cicerone to another buyer that lives in Madison, Florida. I'll try to get the his name & put him in contact with your website, as well as Bob Doepel. Thanks for all your help & enthusiasm. You have a great website. Maybe one day I will have time to pursue another Dolphin. I really did fall in love with her lines. This page started on June 15, 2009. DFI (Dolphin Field Investigator) David Driggers found Cicerone on the hard near Tallahasse, FL in late April and checked her in. Today he reports she is now his! Well on June 13, I struck a deal with the current owner and shipwright, Ken Harper. Ken & his wife Wendy are truly nice people. 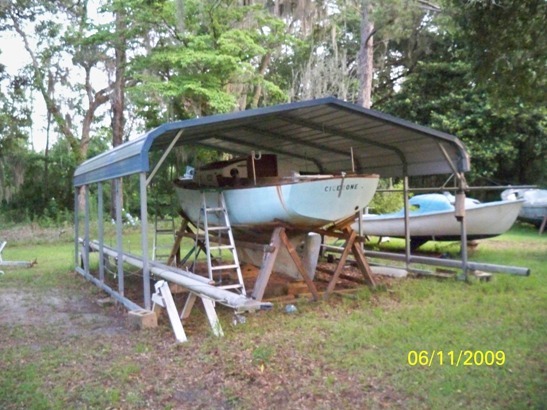 They have lived on & repaired sailboats for more than 20 years. Repairs should begin within the next week or so. The wife & I are very excited! I've attached a picture. I'll send more before & after pictures at a later time. Have you come across any more information from the Wilmette fleet concerning Cicerone? 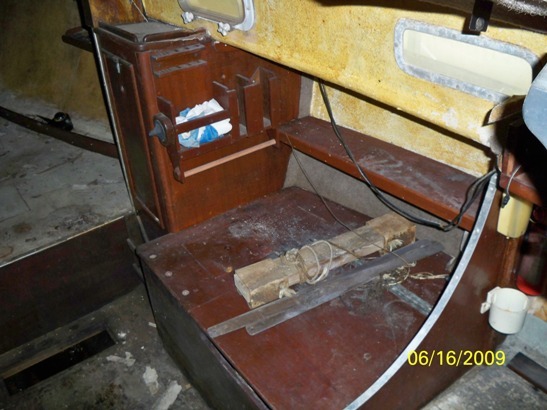 This boat once belonged to Robert Dopel and was a member of the Wilmette Dolphin Fleet. Click here to find out more about that fleet. We are working on finding out more about her. I have come across Hull # 19 - Cicerone. 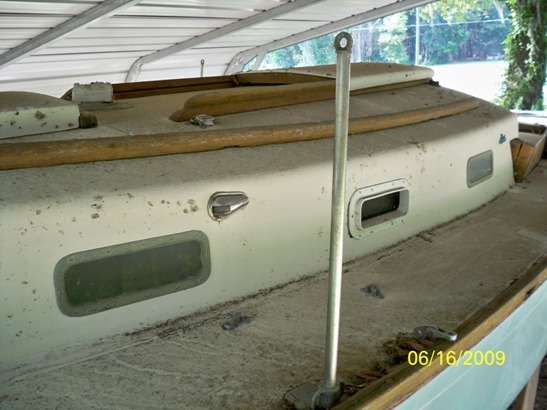 She is located on the hard near Tallahassee , FL and is next in line to be restored. 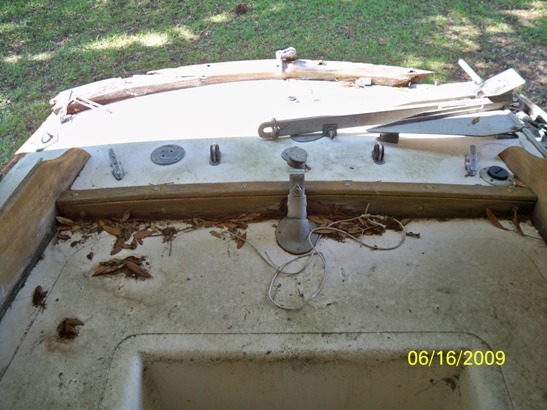 The hull looks to be in great shape while the wood work needs attention. I have a digital camera and will make sure to take several pics and send them your way. 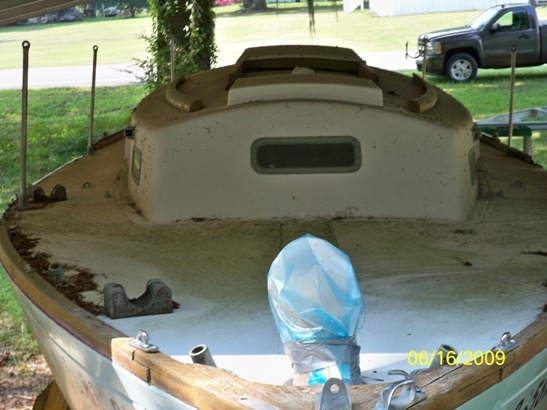 I am considering purchasing the boat. The ID tag looks just like the tag on one of your main webpages. 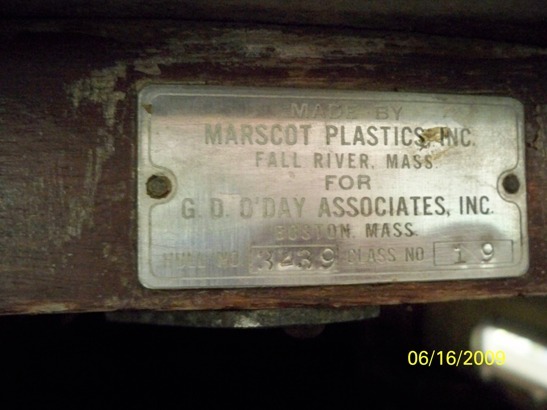 She still has the plastic "O'Day" badge on her side near a port light as well as the metal plate "Made by Marscot Plastics Inc.....G. D O'Day Assoc.... Hull # 3239 Class # 19. 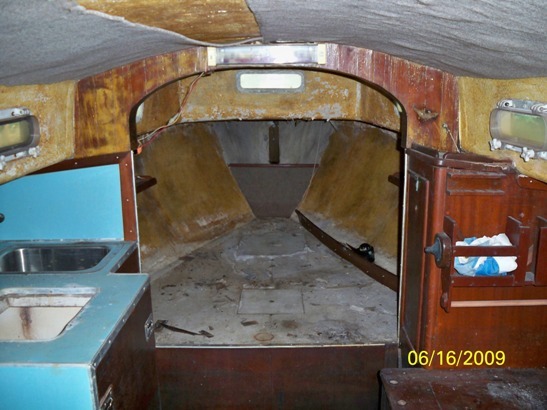 The interior is in rough condition, but seems to have been finished out nicely at some time. The wood used appears to be mahogany. It is quite dried out and flaky but appears to be solid enough to bring back to life. There is a double forward in the bow and 2 quarter berths. The engine has been replaced by a single cylinder Yanmar diesel. The counter top appears to be a green Formica. 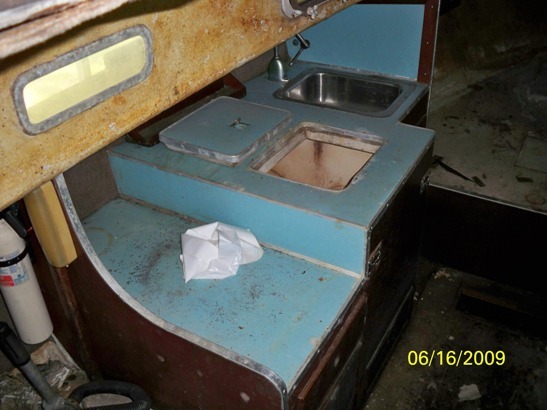 There are several cabinets, a sink, and what appears to be the original head. The hull is currently painted a baby blue, while the top is white. 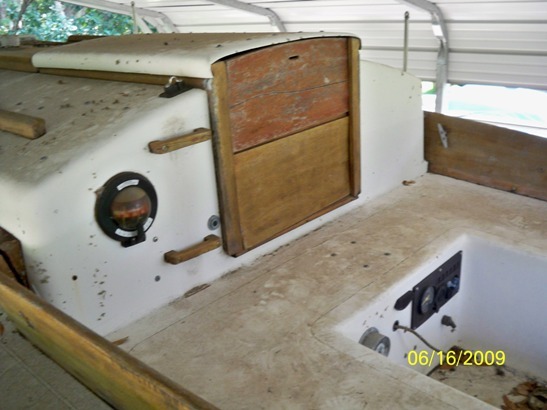 In considering the purchase I plan to go with a dark blue hull and a white top-side. Thanks again for all your help. I'll check the links you provided. If I find any more history from the current owner I'll be sure to send it along. July 8, 2008. The "Hull Number" is 3239. The "Class Number" is 19. For Dolphin 24 purposes the Hull # is 19. The other number appears to be somekind of other production control number. For more on nameplates and hull #'s click here. The Yanmar diesel replaced the original Palmer gas engine. The new fuel tank will go in the space where to old gas tank was - in back of the engine. January 17, 2010. A couple of days ago we heard from Bob Doepel who was the first owner of Cicerone, buying her on May 17, 1961. You don't know me. 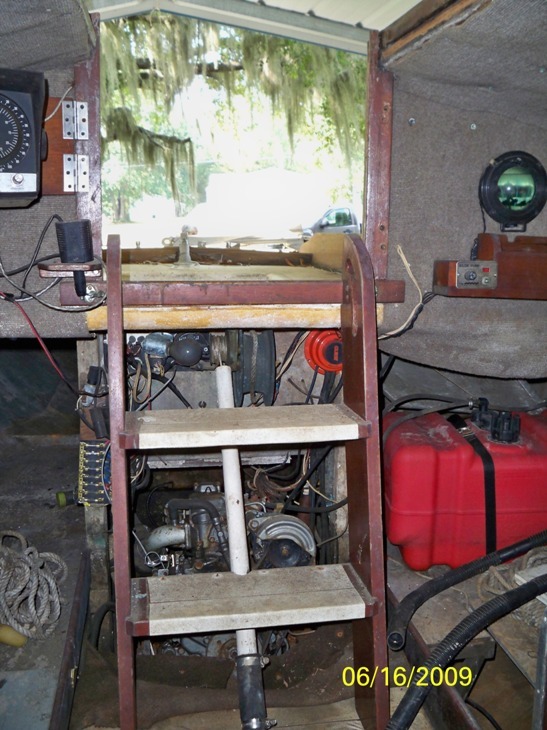 Last night I was wondering (I'm now 82 years old and wonder a lot, ha) about the where-a-about's of a boat I once owned. So....I went and goggled "O'Day Dolphin" and guess what I found. You got it, the web site is fantastic. I was amazed to find it listed (#19) I have the original bill of sale. It is listed as Hull No. D-19-3239. Also was amazed that it still has the original name as she was christened with by me, the CICERONE. I also have a copy of the bill of sale when I sold it, dated March 17 1975. I have many memories of her, to say the least it was a very honest vessel with no bad habits. Would be fun to contact the new owner, David Drigger. If you can send me his contact information that would be great. If you would like the history of her first 14 years will comply with the best of my recollections. We are trying to get Bob and Dave in touch with each other, and await further news on Cicerone's beginnings. Stay tuned.